So… we began our cooking collaboration with pasta. We really want to support small producers, local where possible so we used Chapel Farm eggs which had the most beautiful, brightest yellow yolks and Wessex Mill Pasta and Pizza Flour. The flour has a Good Taste Award and is the colour of a really smart off-white heritage paint and totally unlike that schreechingly bright white supermarket stuff. 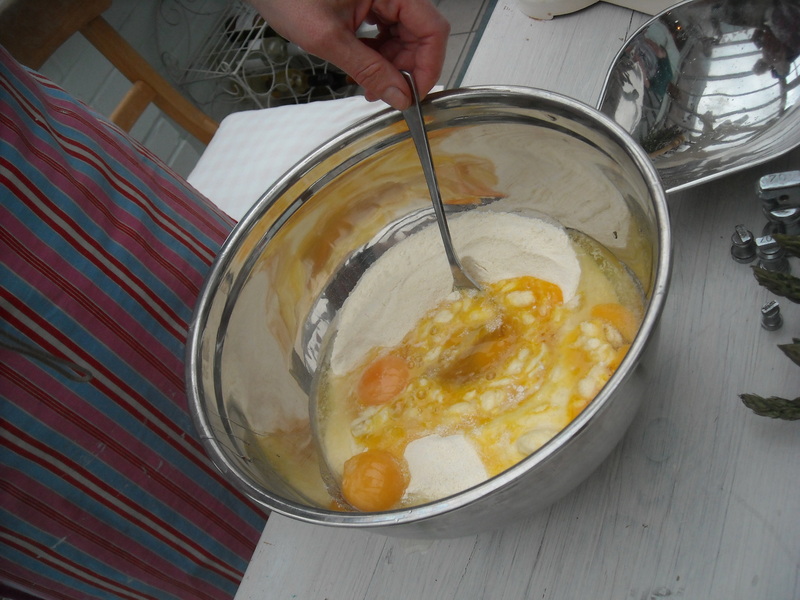 Making the pasta was easy-peasy, like Jamie says ” just chuck the eggs and flour together, no big deal”. Rolling it out was fun as we were by now on our second bottle of celebratory fizz. 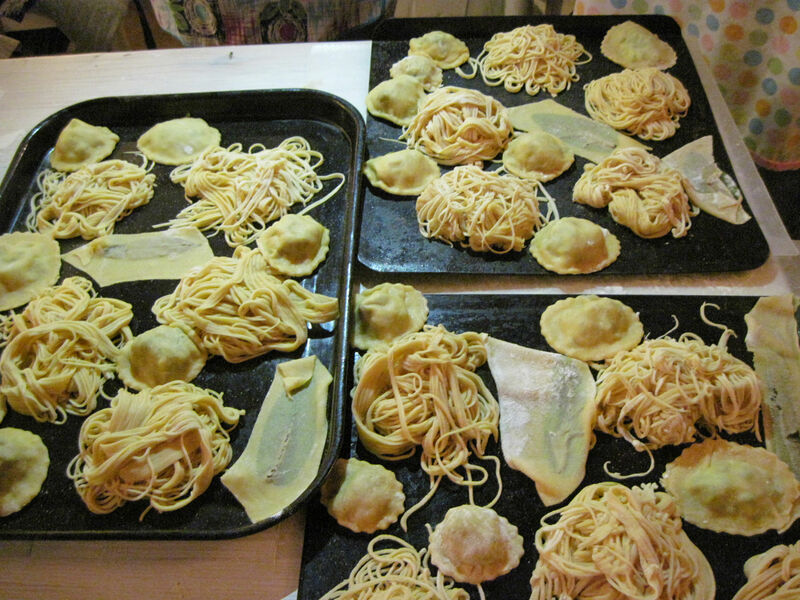 So to stuffing… we wanted to make RAVIOLI and we were super hungry. 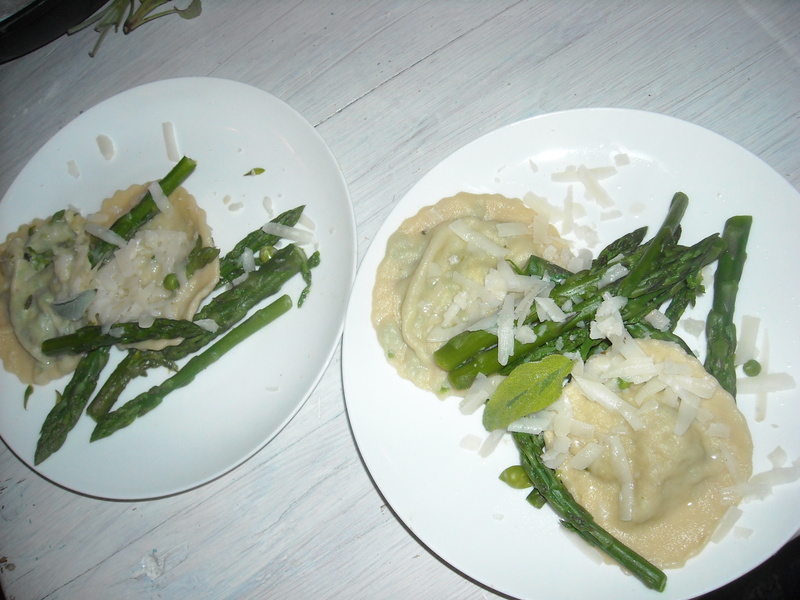 We had local asparagus, potatoes, peas, goats’ cheese and lovely mint from Mandy’s garden so we did two sorts of ravioli…here’s the recipes, bit vague but that’s how we roll..
We cooked some peas (from pods, real peas…you know?) then added some frozen ones too for their zingy green and sweetness…drained them then crumbled in some goats’ cheese and chopped mint, some olive oil and loads of black pepper. We lightly cooked the asparagus stalks and added them to crushed cooked potatoes, and then softened with garlic, parmesan, nutmeg and pepper (we like pepper). 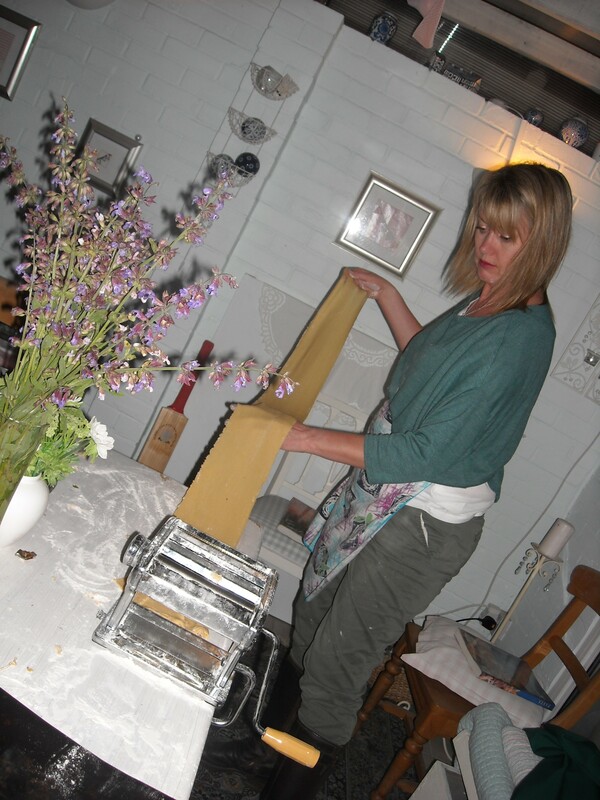 We had loads of pasta left so we rolled whole sage leaves into squares of it which looked super pretty and we made lots and lots and lots of linguine. Things were getting proper messy now and we had covered most of the room with pasta so we cooked some of everything to try. We cooked the asparagus tips in with the pasta (which takes no time at all) and served with Loseley butter, extra parmesan, pepper and sage leaves. This entry was posted in pasta and tagged asparagus, asparagus stalks, butter, cheese, eggs, Farnham, flour, food, goats' cheese, mint, parmesan, pasta, peas, ravioli, sage. Bookmark the permalink. ← La Culinari is born.